Bras were once designed by sewing two handkerchiefs together and wrapping a bow around them, but times have certainly changed. The evolution of the brassiere is incredible, and it definitely makes you appreciate how comfortable and lightweight the styles are that we can now enjoy. Gone are the days of body-sucking corsets and unsupportive styles. Thank goodness! By understanding exactly what goes into each bra design, you’ll have further appreciation for the craft that has made bras a much more pleasant and beneficial experience for all of us. There are two absolutely crucial measurements that play a huge factor in the design and manufacturing of each bra. It’s the band and cup size, but before many designers even get to that point, they need to first decide on the physical appearance and structure of each style. Decisions are made on the entire collection as a whole, as well as any special features, cuts, sizes, costs and quality as well as many other factors. These are generally the main guidelines that lead to the actual manufacturing of a bra. Protoypes are then drawn up and patterns are designed and picked out. 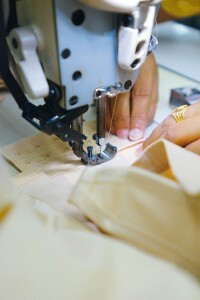 The bra is then cut out usually out of cardboard with computerized technology and then assembled to see if any modifications need to be made before manufacturing the actual product. Final selections are tested out to ensure that only the highest quality, proper fit and accurate sizing is prominent, then the bra is ready to be produced in quantity. Anita uses software to design the best fitting bras. The actual manufacturing of each bra is truly specific to each company. However, this is the general process or guidelines that many follow. The components of the bras are cut out according to pattern specifications, such as the cup top, bottom, straps, center as well as the side and back panels. Then, it’s time to start the sewing process. High quality bra manufacturing companies will use top-of-the-line industrial grade sewing machines. Hooks and eyes are sewn on precisely and ironed or heat processed into the back panel. Lastly, the label of the bra is stitched on last. Similar to the design and manufacturing process, the packaging of bras is different with each company. However, usually all finally products are sorted by style and folded before being boxed and sent to the distributors. Some companies have fancy packaging to ensure proper transportation and quality of their product, while others will just add them into plastic bags and send out as it is. Although the process in which a bra is made is fairly similar across the industry, it’s the minor details and specifications that each company has that separates the poorly made bras from the high quality ones that can be found on Anita. Many prestigious brassiere companies contribute a significant amount of time in the design and manufacturing process to ensure the quality of the final product. Others may just go through sizing quickly for mass production, which can jeopardize the overall comfort and style of the bra. Since you have to wear a bra every day, it is highly recommended to invest in your breasts, and enjoy wearing such a crucial part of your wardrobe. Reading this article made my eyes hurt due to the font. Can you thicken the font a little bit? It is almost transparent making it very annoying to read.